Tonight, [Feb 18, 2018] I appeared on the ABC’s National Wrap to debate the Migration Council’s CEO, Carla Wilshire, on Australia’s mass immigration program. Below are notes from the debate explaining my position and refuting Ms Wilshire’s key lines of argument. By Unconventional Economist in Australian Economy at 11:01 pm on February 18, 2018. First published at https://www.macrobusiness.com.au/2018/02/leith-van-onselen-tackles-growth-lobby-monster/. During the debate, we got into an exchange over the purported economic benefits of immigration, as noted by the various Productivity Commission (PC) modelling. Ms Wilshire argued the modelling shows unambiguous benefits to Australians because GDP per capita is increased, whereas I argued that incumbent Australian workers are made worse-off from falling wages (let alone broader impacts like congestion, higher infrastructure costs, smaller and less affordable housing, etc). At the outset, it is important to note that economic modelling around immigration is inherently limited and often does not reflect real life. First, it is generally assumed in these models that population ageing will result in fewer people working, which will subtract from per capita GDP. However, it is equally likely that age-specific workforce participation will respond to labour demand, resulting in fewer people being unemployed, as we have witnessed in Japan, where the unemployment rate is below 3%. Even if this assumption holds true, the benefit to GDP per capita would only be transitory. Once the migrant workers grow old, they too will add to the pool of aged Australians, thus requiring an ever increasing immigration intake to keep the population age profile from rising. Second, it is generally assumed that migrant workers are more productive than the Australian born population and, therefore, labour productivity is increased through strong immigration. 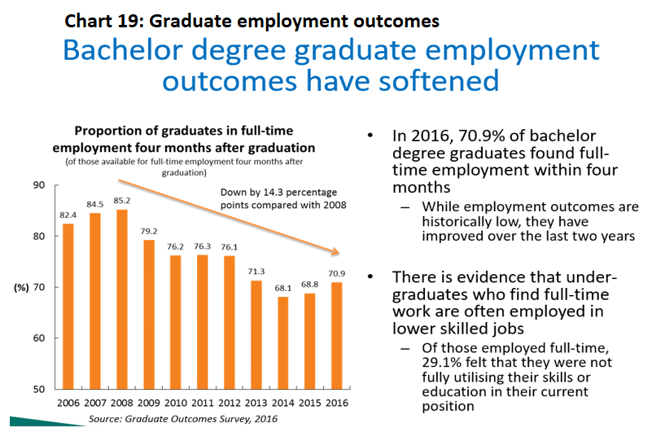 However, the evidence here is highly contestable, with migrants generally being employed below the level of their qualifications, as well as having lower labour force attachment than the Australian born population (more information here). Third, these economic models typically assume that immigration allows for either steady or increasing economies of scale in infrastructure (i.e. either assumes that population growth does not diminish the infrastructure stock; that bigger is always cheaper; or there is under-utilised capacity). At the same time, they completely ignore the dead weight of having to build more infrastructure each year, as well as the dis-economies of scale from having a bigger population, which necessarily makes new infrastructure investment very expensive (e.g. tunneling, land buy-backs, water desalination, etc). Finally, and related to the above, these models ignore obvious ‘costs’ of mass immigration on productivity. 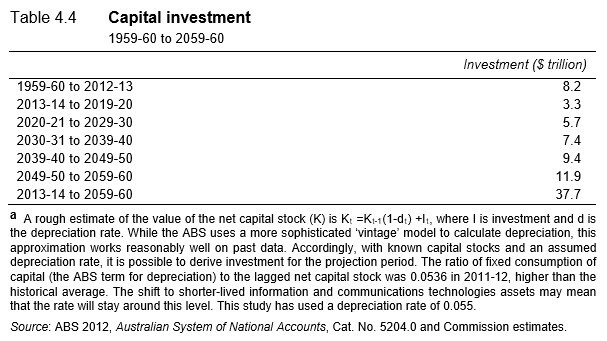 Growing Australia’s population without commensurately increasing the stock of household, business and public capital to support the bigger population necessarily ‘dilutes’ Australia’s capital base, leaving less capital per person and lowering productivity. We have witnessed this first hand with the costs of congestion soaring across Australia’s big cities. With these caveats in mind, what does the PC’s modelling on immigration actually say? 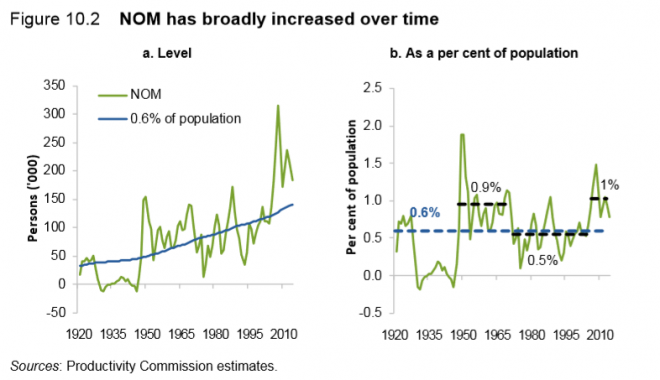 Zero net overseas migration (NOM), whereby the population stabilises at 27 million by 2060. The continuation of an immigration system oriented towards younger working-age people can boost the proportion of the population in the workforce and, thereby, provide a ‘demographic dividend’ to the Australian economy. However, this demographic dividend comes with a larger population and over time permanent immigrants will themselves age and add to the proportion of the population aged over 65 years. 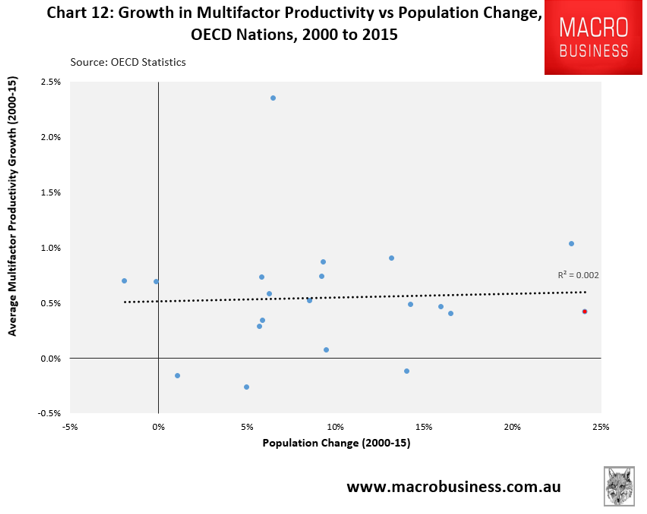 While the economywide modelling suggests that the Australian economy will benefit from immigration in terms of higher output per person, GDP per person is a weak measure of the overall wellbeing of the Australian community and does not capture how gains would be distributed among the community. Whether a particular rate of immigration will deliver an overall benefit to the existing Australian community will crucially depend on the distribution of the gains and the interrelated social and environmental impacts. As the modelling broadly assumes that there are constant returns to scale in production, the economy-wide modelling results are broadly linear. Hence, while the modelling provides insight into the economic impact of NOM, in practice limits on Australia’s absorptive capacity (including environmental factors) mean that constant returns to scale are unlikely to hold for very high rates of immigration. Clearly, this assumption is at at odds with the Australian economy’s ‘lived experience’, whereby massive infrastructure deficits have accumulated over the last 15-years of hyper immigration, particularly in the major cities. With zero NOM, real wages are projected to increase over time, and at a rate greater than in the business-as-usual scenario. 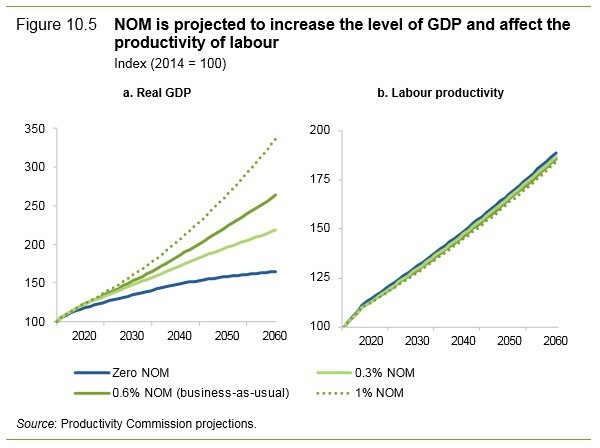 That is, in the zero NOM scenario labour is relatively scarce which puts upwards pressure on real wages and causes a substitution towards capital, contributing to the marginally higher labour productivity relative to the business-as-usual scenario (figure 10.5, panel b). Higher rates of labour force participation through immigration in the business-as-usual case is projected to moderate such wage pressures. Therefore, according to the PC’s most recent modelling, high immigration improves per capita GDP by 2060 by boosting the proportion of workers in the economy, but this comes at the expense of lower labour productivity and lower real wages. Moreover, beyond the forecast period (2060), the migrants will age and retire, thus dragging down future growth – classic ‘ponzi demography’. As noted by the PC above, its latest modelling also did not take account of the distribution of gains to per capita GDP, which is vitally important. Thankfully, it’s 2006 major study on the Economic Impacts of Migration and Population Growth did, and the results were unflattering. Immigration, as a major source of population growth in Australia, contributes to congestion in the major cities, raising the importance of sound planning and infrastructure investment …governments have not demonstrated a high degree of competence in infrastructure planning and investment. Funding will inevitably be borne by the Australian community either through user-pays fees or general taxation. Accordingly, the PC explicitly asks that these costs be considered as part of any cost-benefit analysis on the immigration intake, rather than blindly following the results of its modelling. …where assets are close to capacity, congestion imposes costs on all users. A larger population inevitably requires more investment in infrastructure, and who pays for this will depend on how this investment is funded (by users or by taxpayers). Physical constraints in major cities make the costs of expanding infrastructure more expensive, so even if a user-pays model is adopted, a higher population is very likely to impose a higher cost of living for people already residing in these major cities. Growing populations will place pressure on already strained transport systems… Yet available choices for new investments are constrained by the increasingly limited availability of unutilised land. Costs of new transport structures have risen accordingly, with new developments (for example WestConnex) requiring land reclamation, costly compensation arrangements, or otherwise more expensive alternatives (such as tunnels). In short, there is little hope of achieving the level of investment required to sustain current levels of mass population growth, let alone an increase in the immigration intake to 250,000 (from 210,000 currently), as demanded by the Migration Council. Overall, the PC’s economic modelling on immigration shows little (if any) material economic benefit to incumbent Australian residents. And once you add the various external costs not captured in the modelling (e.g. 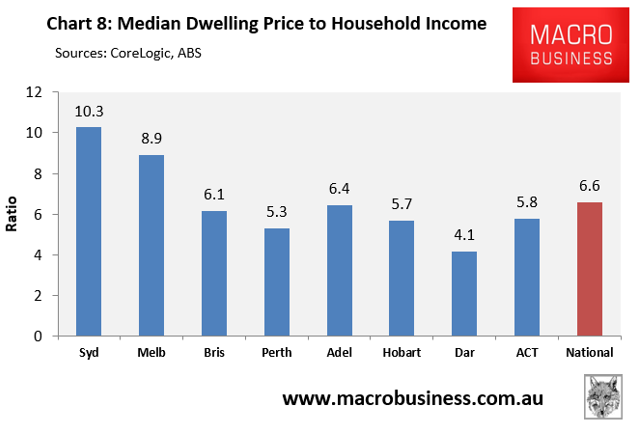 more expensive housing, more expensive infrastructure, congestion, and environmental degradation), the overall costs of mass immigration to ordinary Australians almost certainly outweighs the benefits. Further information on why mass immigration is not in Australia’s interest is explained in MB’s submission to the federal government’s Migration Program review, which is reproduced below. (You can also download a PDF copy here – please share it around). In taking this line of argument, Ms Wilshire is being very loose with the facts. 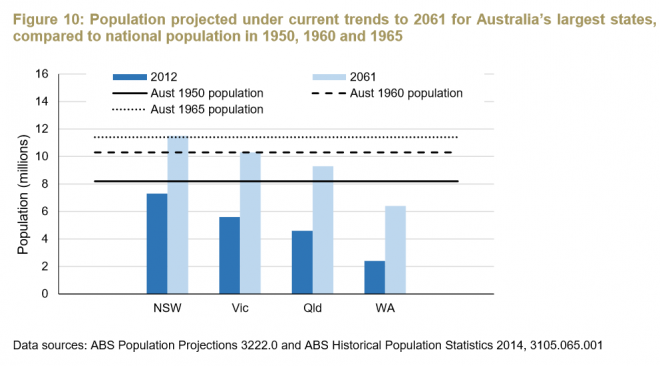 Figure 10 shows that under the ABS central forecast, in 2061 Victoria would have the same population as all of Australia had in 1960. In 2061 Queensland would have a larger population than all of Australia had in 1950. It is important to note that these are not the projections of the high growth scenario (Series A), but of the one that most closely matches current trends (Series B). How much population is enough? During the interview, I claimed that the Migration Council’s economic modelling on immigration could not be trusted as it is a vested interest lobby group backed by big business. Ms Wilshire responded angrily claiming that it was non-partisan and not-for-profit. Since its inception, the organisation has lobbied strongly for a ‘Big Australia’ and for the immigration intake to be increased to 250,000 (from 210,000 currently). It has also been chaired by pro-Big Australia business people and has stacked its board accordingly. MAJOR investor and former Elders executive Peter Scanlon hardly blinks when asked if his conspicuous support for a bigger population is also good for business. Mr Scanlon, whose family wealth is estimated to be more than $600 million, has set up a foundation with the aim to create a larger and socially cohesive Australia. It also happens that Mr Scanlon has extensive property development interests, which clearly benefit from immigration-fuelled high population growth. Peter Scanlon vacated the chair of the Migration Council in 2015 and was replaced by long-time mass immigration booster and Australian Industry Group CEO, Innes Willox, who was affectionately described last year by The AFR “as one of Australia’s top business lobbyists”. Let’s not pretend that the Migration Council of Australia is impartial in the immigration debate. It is a stealth ‘Big Australia” lobbyist for the business sector. On a side note, a quick look at the Migration Council’s modelling of immigration’s economic impacts reveals the following howler of an assumption: it “allows for economies of scale in infrastructure”. You read that right. Their model ridiculously assumes that bigger is always cheaper and/or there is always under-utilised capacity. This flies in the face of the ‘lived experience’ of growing infrastructure bottlenecks and rising congestion costs, as well as increasingly complex and expensive infrastructure projects (i.e. classic dis-economies of scale). I’ve already discussed these infrastructure issues above with respect to the PC’s modelling, so I won’t do it again. But clearly the Migration Council has chosen favourable assumptions to get a positive modelling result in support of its Big Australia agenda. Garbage in, garbage out. Only in the Bizarro World of the Migration Council do you solve an infrastructure deficit by adding millions more people. And only in the Migration Council’s world does having to live in shoebox apartments, suffering from greater congestion, as well as making everyone consume less of everything, just so we can make room for mass immigration, equate to higher living standards. At MacroBusiness we support immigration, but at sustainable levels. Australia’s immigration levels are too high – higher than our cities can absorb. The infrastructure costs of high immigration are excessive and Australia’s infrastructure supply is not keeping up with demand, despite our best efforts. The economic arguments frequently used to justify high immigration fail the evidence test. Empirical data does not support mass immigration. Excessive immigration also damages Australia’s employment market and the environment. It is time for an honest debate. 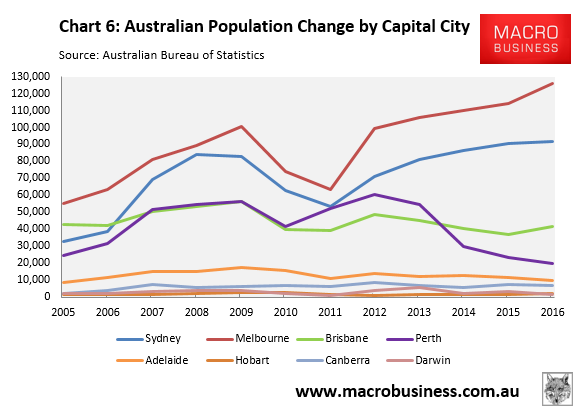 Currently, Australia’s immigration program is overloading the major cities with tens of thousands of extra people each year to stoke overall economic growth (but not growth per person) and to support business (e.g. the property industry and retailers), despite growth per person stagnating. Meanwhile, individual living standards are being eroded through rising congestion costs, declining housing affordability, paying more for infrastructure (e.g. toll roads and water), environmental degradation, and overall reduced amenity. The economic evidence for the above is contained in this submission. The Australian Government needs to stop ignoring these issues. Australia’s living standards are at stake. MacroBusiness urges the Australian Government to reduce Australia’s immigration intake back towards the historical average of around 70,000 people per annum. 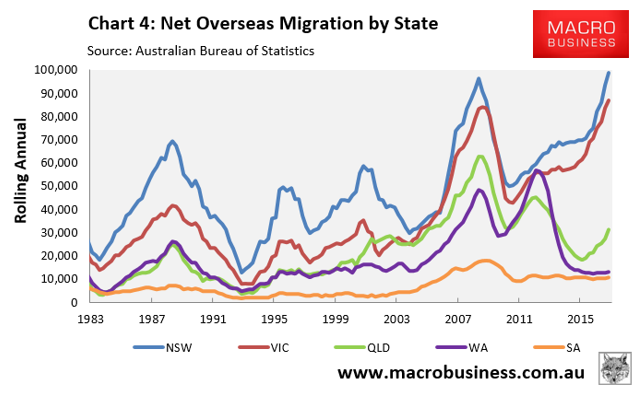 One of the most profound changes affecting the Australian economy and society this century has been the massive lift in Australia’s net immigration, which surged from the early-2000s and is running at roughly triple the pace of historical norms (Chart 1). In the 116 years following Australia’s Federation in 1901, Australia’s net overseas migration (NOM) averaged around 73,000 people a year and Australia’s population grew on average by around 180,000 people. 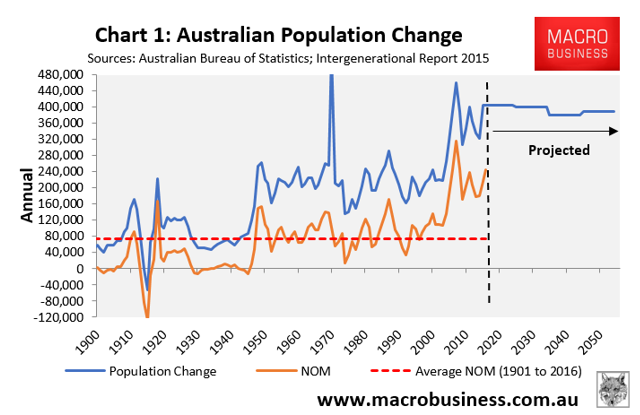 Over the past 12 years, however, Australia’s annual NOM has averaged nearly 220,000 people a year and Australia’s population has grown on average by 370,000 people. 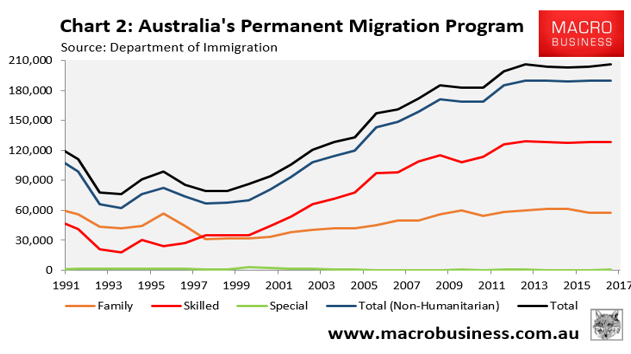 The principal driver of Australia’s population increase has been the Australian Government’s permanent migrant intake, which has increased from 79,000 in 1999 to nearly 210,000 currently, including the humanitarian intake (Chart 2). 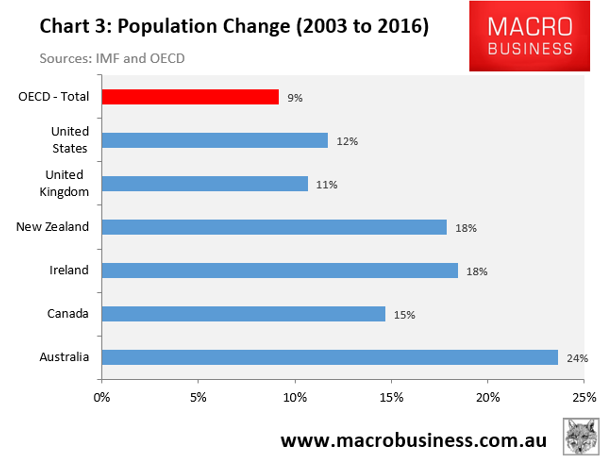 Due to this mass immigration ‘Big Australia’ policy, Australia’s population has expanded at a rate that is more than 2.5 times the OECD average, easily the fastest of advanced English-speaking nations (Chart 3). 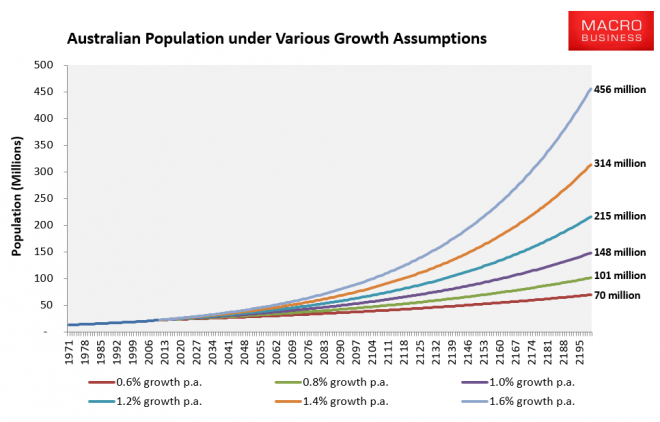 This rapid population growth is expected to continue for decades to come, with the Australian Government’s Intergenerational Report projecting population growth of nearly 400,000 people a year – equivalent to one Canberra – until Australia’s population reaches 40 million mid-century (see Chart 1 above). However, the problem with Australia’s mass immigration policy is not just the extreme volume, but also the concentration of migrants flowing to Australia’s largest and already most overcrowded cities. 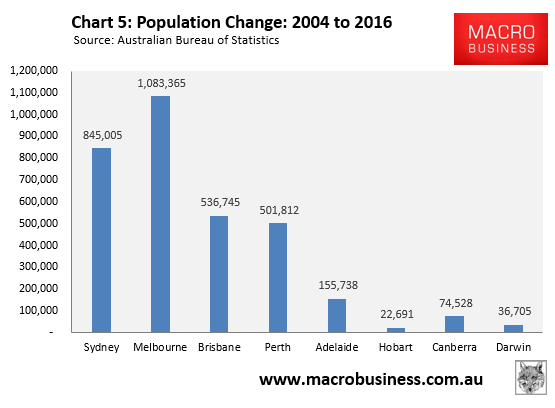 In the 12 years to 2016, Melbourne’s population expanded by nearly 1.1 million (30%), while Sydney’s population expanded by 845,000 (20%). 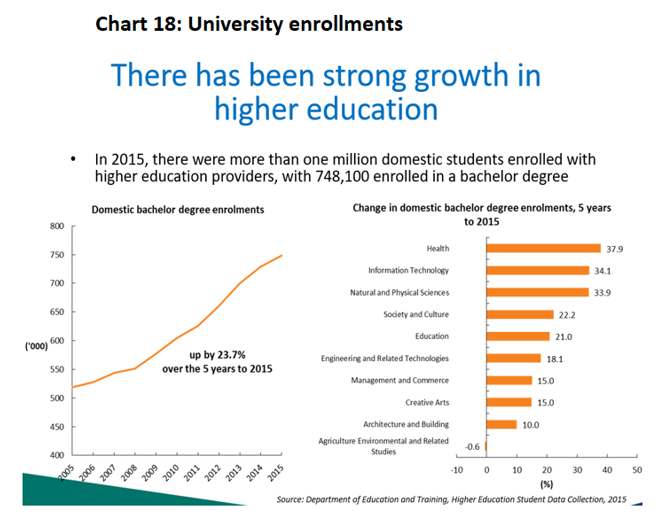 There was also strong growth in Brisbane (537,000) and Perth (502,000) (Charts 5 and 6). 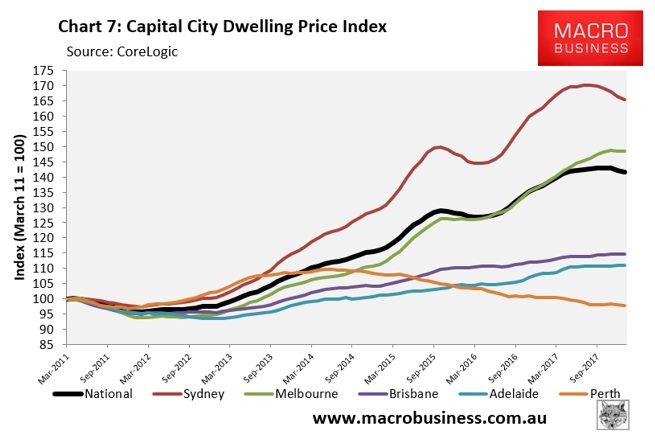 The migrant influx helps to explain why dwelling price growth has been strongest in Sydney and Melbourne, and why housing is most unaffordable in these two cities (Charts 7 and 8). While the Australian Government and property lobby likes to blame a ‘lack of supply’, the problem rests primarily with excessive demand from mass immigration. The chronic problems around housing and infrastructure will only get worse under the current mass immigration policy. State Government projections have Melbourne’s population expanding by 97,000 people each year (1,870 people a week) and Sydney’s by 87,000 people each year (1,670 people each week) for the next several decades until both cities’ populations hit around 8 million people mid-century. It took Sydney around 210 years to reach a population of 3.9 million in 2001. And yet the official projections have Sydney adding roughly the same number of people again in just 50 years. It took Melbourne nearly 170 years to reach a population of 3.3 million in 2001. In just 15 years, Melbourne expanded by 34% to 4.5 million people. And the official projections have Melbourne’s population ballooning by another 3.4 million people in just 35 years. No matter which way you cut it, residents of our two largest cities will continue to feel the impact of this rapid population growth via: traffic gridlock; overloaded public transport, schools, and hospitals; pressures on energy and water supplies; as well as more expensive (and smaller) housing. It is a clear recipe for lower living standards. Politicians and economists frequently claim that maintaining a ‘strong’ immigration program is essential as it keeps the population young and productive, and without constant immigration, the population would grow old and the economy would stagnate. For example, Prime Minister Malcolm Turnbull has stated previously that “anyone who thinks it’s smart to cut immigration is sentencing Australia to poverty”. In a similar vein, former KPMG partner and “unabashed supporter of a bigger Australia”, Bernard Salt, has produced reams of articles warning that Australia faces economic and fiscal catastrophe without ongoing strong immigration. Economic models are often cited as proof that a strong immigration program is ‘good’ for the economy because they show that real GDP per capita is moderately increased via immigration, based on several dubious assumptions. First, it is generally assumed in these models that population ageing will result in fewer people working, which will subtract from per capita GDP. However, it is just as likely that age-specific workforce participation will respond to labour demand, resulting in fewer people being unemployed, as we have witnessed in Japan, where the unemployment rate is below 3%. Even if this assumption was true, the benefit to GDP per capita would only be transitory. Once the migrant workers grow old, they too will add to the pool of aged Australians, thus requiring an ever increasing immigration intake to keep the population age profile from rising. Indeed, the Productivity Commission (PC) has for more than a decade debunked the myth that immigration can overcome population ageing. For example, in its 2010 submission to the Minister for Population, the PC explicitly noted that “substantial increases in the level of net overseas migration would have only modest effects on population ageing and the impacts would be temporary, since immigrants themselves age”. Academic demographer, Peter McDonald, has also previously stated that it is “demographic nonsense to believe that immigration can help to keep our population young” . Third, economists and their models generally ignore obvious ‘costs’ of mass immigration on productivity. 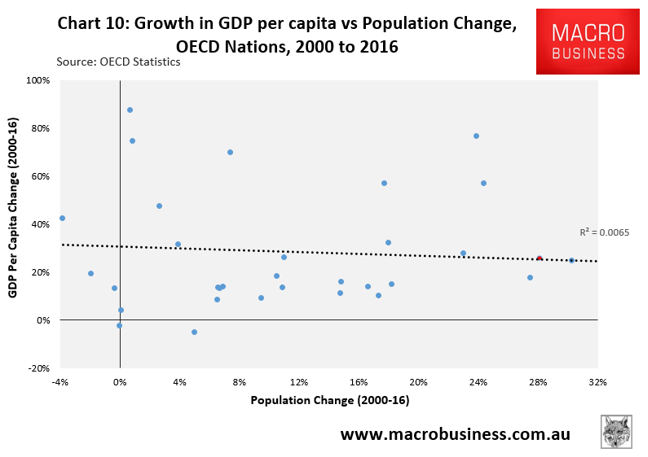 Growing Australia’s population without commensurately increasing the stock of household, business and public capital to support the bigger population necessarily ‘dilutes’ Australia’s capital base, leaving less capital per person and lowering productivity. We have witnessed this first hand with the costs of congestion soaring across Australia’s big cities. “Growing populations will place pressure on already strained transport systems… Yet available choices for new investments are constrained by the increasingly limited availability of unutilised land. Costs of new transport structures have risen accordingly, with new developments (for example WestConnex) requiring land reclamation, costly compensation arrangements, or otherwise more expensive alternatives (such as tunnels)” . Finally, while economic models tend to show a modest improvement in real GDP per capita, the gains are more likely to flow to the wealthy, whereas ordinary workers are made worse-off. In 2006, the PC completed a major study on the Economic Impacts of Migration and Population Growth, which modelled the impact of a 50% increase in the level of skilled migration over the 20 years to 2024-25. The modelling found that even skilled migration does not increase the incomes of existing residents. According to the Commission: “the distribution of these benefits [from skilled migration] varies across the population, with gains mostly accrued to the skilled migrants and capital owners. The incomes of existing resident workers grow more slowly than would otherwise be the case” . Of course, there are other costs borne by incumbent residents from immigration that are not captured in the economic modelling, such as worsening congestion, increased infrastructure costs, reduced housing affordability, and environmental degradation – none of which are given appropriate consideration by politicians nor economists. Adding a Canberra-worth of population to Australia each and every year – with 80,000 to 100,000-plus people going to Sydney and Melbourne – requires an incredible amount of investment just to keep up. Accordingly, Australia’s infrastructure deficit has fallen badly behind over the past decade, and will continue to do so under Australia’s mass immigration program, thus eroding residents’ living standards. While the economic models might show small per capita gains from immigration-fuelled population growth, based on faulty assumptions, the actual empirical evidence shows no link between population growth and prosperity. 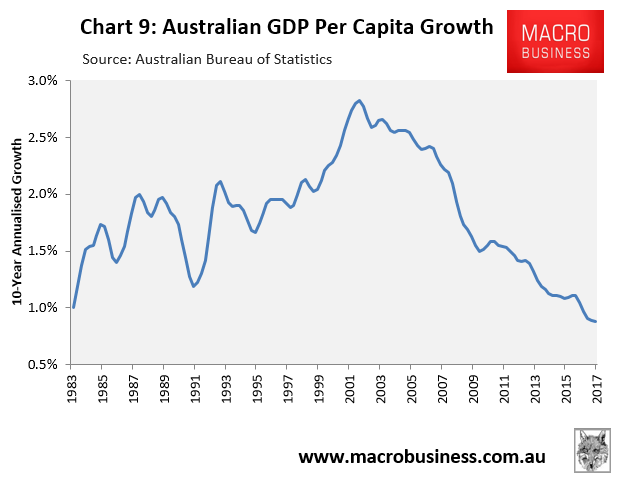 Since Australia’s immigration intake was expanded in the early-2000s, trend GDP per capita growth has plummeted to recessionary levels, suggesting falling living standards (Chart 9). 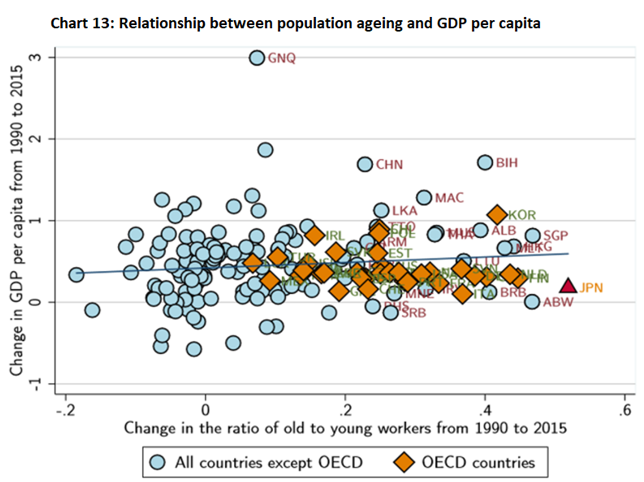 A recent study by economists at the Massachusetts Institute of Technology (MIT) also found “that even when we control for initial GDP per capita, initial demographic composition and diﬀerential trends by region, there is no evidence of a negative relationship between aging and GDP per capita; on the contrary, the relationship is signiﬁcantly positive in many speciﬁcations” (Chart 13). There is also evidence to suggest that mass immigration is partly behind Australia’s trade and current account deficits, as well as the nation’s ballooning foreign debt. 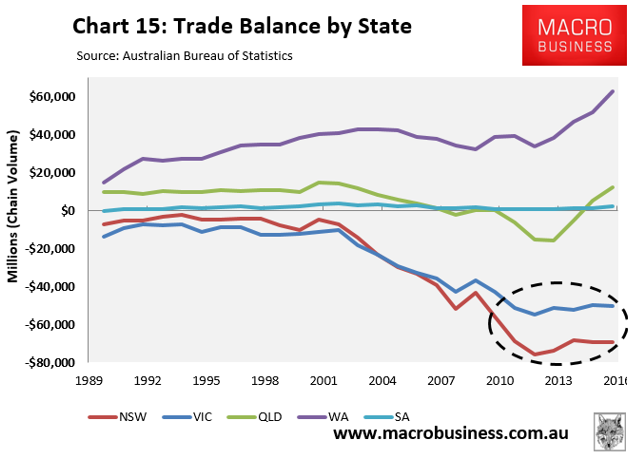 However, the majority of Australia’s imports and indeed private debt flows to our biggest states (and cities), New South Wales (Sydney) and Victoria (Melbourne). Sydney and Melbourne also happen to be the key magnets for migrants (see Charts 4,5 and 6 above). All of these extra imports must be paid for – either by accumulating foreign debt, or by selling-off the nation’s assets. Australia has been doing both. Australia would improve its trade balance and current account deficit, as well as reduce the need to sell-off assets and binge on debt, if it simply cut immigration. 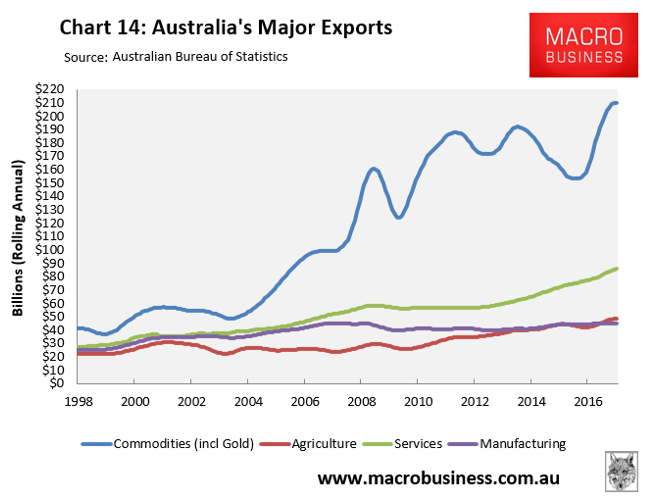 Australia will ship the same amount of hard commodities and agriculture regardless of how many people are coming in as all the productive capacity has been set up and it doesn’t require more labour. 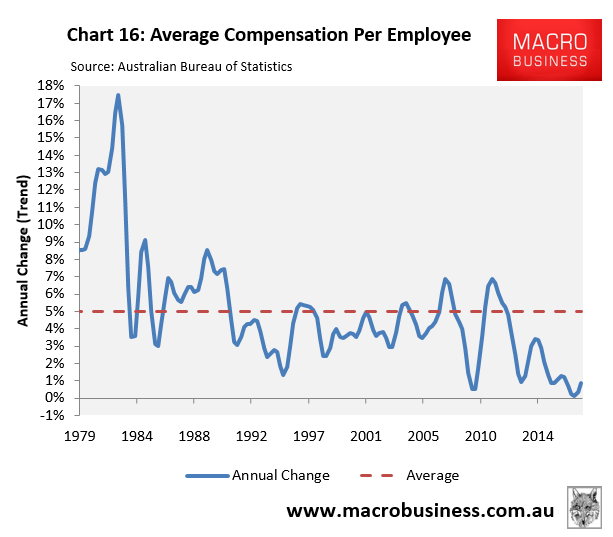 Hand wringing over Australia’s anaemic wages growth (Chart 16) hit fever pitch recently, with politicians, economists and media all searching for answers. One cause that has received scant attention is the role caused by mass immigration in driving-up labour supply and reducing the bargaining power of workers. 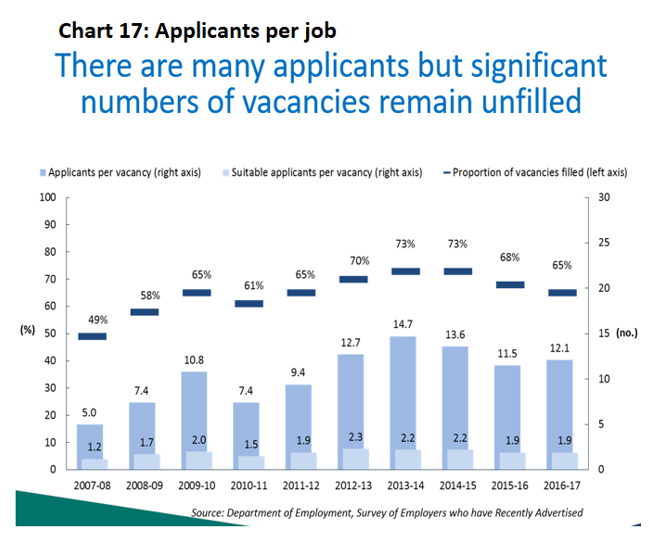 Employer groups often argue that a strong ‘skilled’ migration program is required to overcome perceived labour shortages – a view that is supported by the Australian Government. However, the available data shows this argument to be weak. The Australian Bureau of Statistics’ labour force data also shows that Australia’s underutilisation rate remains high, especially for Australia’s youth, despite the recent improvement in the labour market (Chart 20). Curiously, Australia’s permanent skilled migrant intake is significantly higher today (128,550) than it was at the peak of the mining boom in 2011 (113,850). Why? Unlike then, labour shortages are “limited”, wages growth is running near the lowest level on record, and labour underutilisation is high. What is the economic rationale for running the highest permanent migrant intake on record when economic conditions do not warrant it? Standard economic theory claims that net inward migration has minimal long-term impact on wages. That is, when the quantity of labour increases, its price (wages) falls. This will supposedly increase profits, eventually leading to more investment, increased demand for labour, and a reversal of the initial fall in wages. Immigration, so the theory goes, will enable the larger domestic population to enjoy the same incomes as the smaller population did before. However, a recent study by Cambridge University economist, Robert Rowthorn, debunked this argument. The so-called ‘temporary’ effects of displacing incumbent workers and lower wages can last for up to ten years. And if there is a continuing influx of migrants – as is the case in Australia – rather than a one-off increase in the size of the labour force, demand for labour will constantly lag behind growth in supply . In other words, if the Australian Government was to stem the inflow of foreign workers, then workers’ bargaining power would increase, as will wages growth. It is basic economics. As noted in April last year by The Australia Institute’s chief economist, Richard Denniss, the very purpose of foreign worker visas is to “suppress wage growth by allowing employers to recruit from a global pool of labour to compete with Australian workers”. In a normal functioning labour market, “when demand for workers rises, employers would need to bid against each other for the available scarce talent”. But this mechanism has been bypassed by enabling employers to recruit labour globally. “It is only in recent years that the wage rises that accompany the normal functioning of the labour market have been rebranded as a ‘skills shortage'” . Australia’s youth is effectively caught in a pincer by the Australian Government’s mass immigration program. Not only does it hold down their wages, but it also inflates their cost-of-living via more expensive housing (both prices and rents). The Australian Government under both the Coalition and Labor has long supported mass immigration and a ‘Big Australia’ on flawed economic grounds. Behind the scenes, the ‘growth lobby’ of retailers, the banking sector, the property industry and erroneously named ‘think tanks’ all push the growth-ist agenda, while completely ignoring the cost burden on ordinary residents. At the same time, many on the left pursue the globalist agenda of ‘open borders’ citing spurious social justice concerns. Currently, there is no coherent plan other than to inundate the major cities with extra people each and every year to stoke overall economic growth (but not growth per person), to support big business (e.g. the property industry and retailers), and to prevent Australia from going into recession (despite growth per person stagnating). Meanwhile, individual living standards are being eroded through rising congestion costs, declining housing affordability, paying more for infrastructure (e.g. toll roads, water and energy), environmental degradation, and overall reduced amenity. Never have Australians been asked whether they want a population of 40 million-plus mid-century. Nor whether they want Sydney’s and Melbourne’s populations to swell to eight million mid-century. Yet immigration and population growth affects every facet of Australian life, including: how long one spends stuck in traffic; whether one can get a seat on a train or a spot in hospital or school; and/or whether one can afford a good sized home within a decent commute to where one works. It is a key determinant of living standards above all else, yet is rarely questioned by the media nor politicians. Without mainstream political representation on this issue, divisive elements like Pauline Hanson’s One Nation party have emerged to wrongly use the ills of overpopulation to attack the small number of refugees arriving in Australia, as well as Muslim and Asian immigration. As this submission has shown, there is strong justification to reduce Australia’s permanent migrant intake back to historical levels primarily by slashing skilled migration, which has been the driver of the influx. This would take the strain off the major cities, put a floor under wages growth, and safeguard Australia’s environment. Australia could achieve such immigration cuts without affecting its global obligations via the humanitarian migrant intake. Indeed, much of Australia’s 130,000 strong permanent skilled migrant intake comes from countries where skills are more desperately needed than in Australia. Australia’s immigration program is depriving these countries of skills, and we have a moral obligation to limit the brain drain. More broadly, Australia desperately needs a national debate and a population strategy, led by the Australian Government. The Government needs to conduct a population plebiscite asking Australians how big they want the nation to become, and then set immigration policy accordingly. The Australian Government also needs to provide a comprehensive plan detailing how and where it will accommodate all the extra people, while safeguarding incumbent residents’ living standards. Carla says that people in Australia must eventually accept the changes that population growth necessitates. She needs to accept that if high population growth driven by high migration cannot be changed then Australians especially in the cities will take some time to get to this. The Kubler-Ross 5 stages of grief are 1. denial 2 anger 3. bargaining 4.depresion 5. acceptance. I am not sure what are up to at present. "The Kubler-Ross 5 stages of grief are 1. denial 2 anger 3. bargaining 4.depresion 5. acceptance"
But the trouble is, the stages only apply in situations where there is no more options. There are more options after acceptance in society - i.e acceptance that something is seriously wrong - and that is definitely the stage we do not want to reach, as that is the stage when things get decided ugly as people with nothing more lose not only disengage, but then turn against the system that they see as causing their pain. I suspect the USA is entering into this 6th stage, and that that is also the path we are on, and policy makers are digging the grave of Australian society as we knew it up until the mid-1980's, and even the remnants of that society which still exist today, will all be swept away - first by the systemic onslaught against living standards and families, then by the publics' (mainly young people's) reaction to that. It is very dangerous ground we are entering into. Young people have massive debts, are under enormous stress, and many I suspect wonder if they have a future. What keeps the system going despite all this is the bubbles of mining and housing (which although indebting young people, also keeps them in work building and renovating each others' houses - all on borrowed coin). Take this bubble employment away, and there is not much left but anger or despair. I am sure the policy makers know this, that is why they dare not do anything that will deflate the bubble, yet inevitably it will deflate, and the longer it goes, it worse it seems to be getting. Do we really have to re-iterate that migrants have made a great contribution to Australian society when discussing immigration numbers? "We" have made both good and bad contributions over the last century plus. The level of planned immigration is a policy issue that should be in the interests of the people already living in Australia and not in the interests of economic measures such as GDP or even GDP per capita if the latter more useful measure does not translate into a better quality of life for population already in the country. This serious matter that drastically affects liveability and the environment needs to be kept separate in discussion from the personal realm. Studies of labor migration currently abound in economics, both in the more theoretical branches of the discipline and in empirical re-search. Economists have always had an interest in analyzing labor mobility and the determinants and consequences of location choices. In recent decades, labor migration has become a central feature of many macroeconomic models. It has also been studied in great detail in applied microeconomics analyses. key themes Traditionally, migration research in economics has centered on four key themes. First, the determinants of migration have been the focus of studies that analyze migration decision-making processes and secular trends and fluctuations in migration flows.